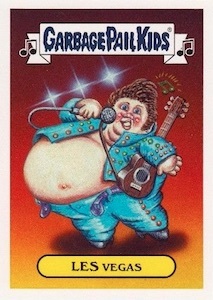 2017 Topps Garbage Pail Kids Series 2 takes the amusing GPK characters into the music world with Battle of the Bands stickers. Hobby packs each include one parallel while Collector boxes deliver one hit. 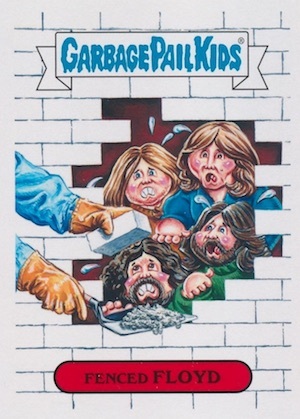 The follow-up to the Series 1 Adam-Geddon product that was fixated on the end of the world, 2017 Topps Garbage Pail Kids Battle of the Bands parodies the biggest musicians in a way that only GPK can. 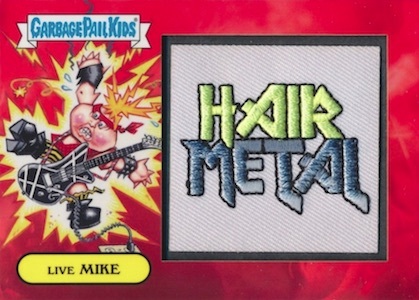 Showcasing fresh artwork, the GPK Battle of the Bands base set includes 180 total stickers split between 90 "A" and "B" names. The checklist covers a wide mix of bands, musicians and singers with different themed subsets. Among the standard parallels are Puke (1 per pack) and Fool's Gold (#/50), while Bruised (1 per Collector pack), Spit (#/99) and Bloody Nose (#/75) parallels are exclusive to Hobby Collector boxes. 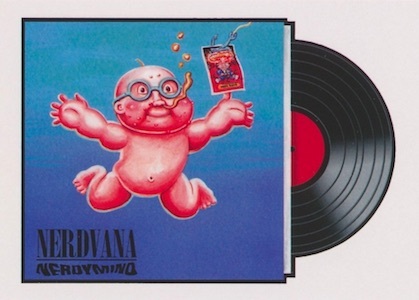 Reimagining iconic music releases, GPK Album Covers puts the Garbage Pail Kids spin on vinyl covers. These sticker inserts are only found in Collector boxes. Although the humor is the main purpose of the release, 2017 Topps Garbage Pail Kids Series 2 Battle of the Bands also features a few options that fall on the premium side. Some of the choices include base Artist Autographs, Sketch cards and Printing Plates. The other hits are exclusive to the Collector boxes which promise one hit per box. These include Shaped Sketch and Double Artist Panoramic Sketch cards along with Patch cards. 180 cards, including 90 A and B names. Shop complete base sets on eBay. PARALLEL CARDS: Puke (1 per pack), Bruised (1 per Hobby Collector Pack), Spit #/99 (Hobby Collector), Bloody Nose #/75 (Hobby Collector), Fool’s Gold #/50, Printing Plates 1/1. 1a of 10 ARE WE NOT MANNY? 10 cards. Hobby Collector. Shop on eBay. 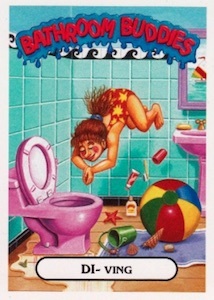 3 BRUCE SPLITJEANS TORN IN THE U.S.A.
20 cards. Hobby Collector. Shop on eBay.